Platform/Venue – There are 3 group Zoom video conference calls, lasting about 90 to 120 minutes, approximately a month apart over a 3-month period. Participants are encouraged to connect one-on-one between calls with at least one other cohort member, either by video conference or in person. Time Commitment – The total time commitment is 8 to 14 hours over a 3-month period, depending on how many one-to-one sessions a participant decides to have. 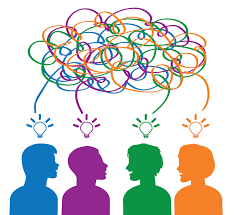 Process – In each group call, the co-conveners will offer a couple of generative questions for each participant’s response where they can share their project and receive input from others. Formal coaching experience is not required – just a willingness to listen and to help create a safe, non-judgmental space for all. 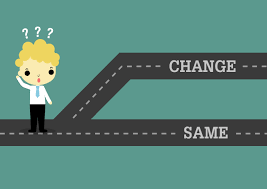 Benefits/Outcomes – Connection with peers, space for reflection, creative solutions, accountability for progress. 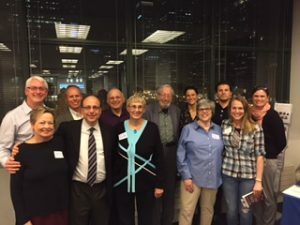 This picture was taken in May of 2016, when Edgar Schein had engaged in conversation with our participants about the meaning of helping each other. It precedes the creation of the Peer Coaching program but reflects the philosophy. The picture includes Schein, current board members, and advisors.